Let me preface this review by saying that I am an enormous Dragon Age fan. It is one of my favorite franchises of all time and I have loved every game, yes even Dragon Age II. One thing that I enjoy about the series is it’s lore, so obviously I’ve devoured all the tie-in novels and comics. These were usually written by the head writer of the games, David Gaider. When he decided to step back from Dragon Age I was a bit bummed. 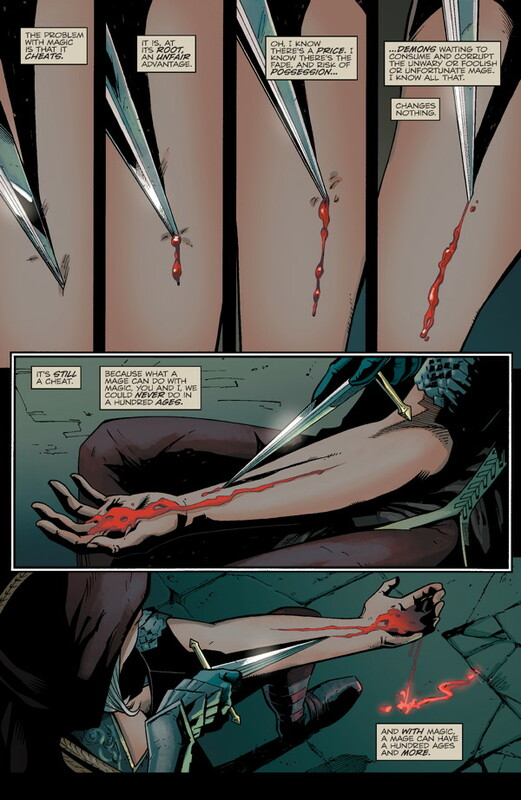 However, I was happy to hear when Dark Horse announced that they would continue to publish Dragon Age comics. When I heard that Greg Rucka, one of the most prolific DC writers out there and the author of my favorite comic book novelization No Man’s Land, was going to write it, I was ecstatic. So, what I’m getting at is, please pardon me for gushing. Partnering with the talented Carmen Carnero, Rucka does an amazing job adding to this already great mythos. For fans of the game who are like me, Magekiller runs parallel to the story in the most recent game, Dragon Age: Inquisition. The story follows a pair of mage hunter mercenaries named Marius and Tessa as they ply their trade throughout the realm of Thedas. The first issue catches up with Marius and Tessa after their most recent job. A job offer takes them to Minrathous, the capital of the Tevinter Imperium. 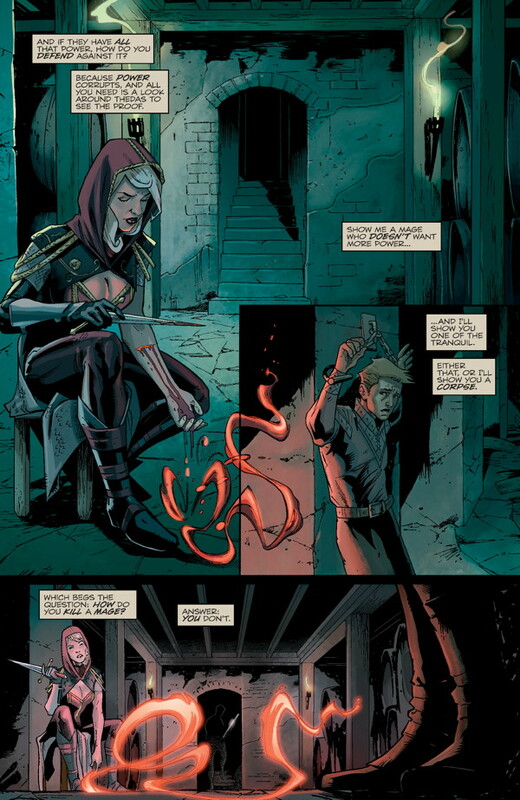 A location only referenced in the games, the mage-governed Imperium seems to be the perfect place for mage hunters such as them. 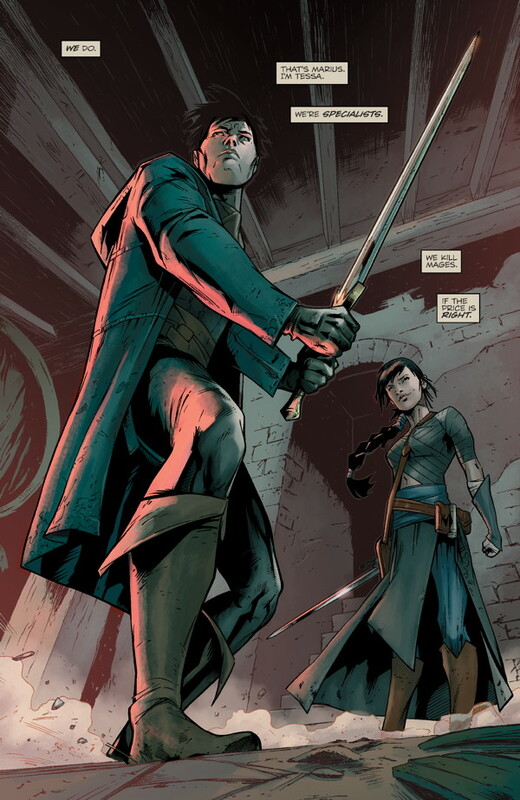 However, Marius is reluctant to take the job due to some mysterious circumstances in his past that have left him with an aversion to Tevinter. All in all, a good premise. The story will be a delight to Dragon Age fans. We are shown our first, albeit brief look at Tevinter, a realm fans have clamoring to see since the first game. From what we see, Tevinter definitely seems like a place where power hungry mages would rule. I was pleased to see that the series was starring a set of original characters. All of the other tie-in materials feature important characters from the games, so it’s nice to have a change of pace. As much as I love seeing a continuation of my favorite characters’ stories, they are limited in what they can do. I’m also happy that we get to see what a mercenary’s life is like in the Dragon Age world, since they just show up as random enemies in the games. I really enjoyed what I saw of the relationship between Marius and Tessa. It’s one of those where there’s a funny and quirky sidekick with a brooding boss. Think Felicity and Oliver Queen. I’m always happy to see that sort of relationship work out in a fantasy setting. There’s just so many different kinds of jokes one can tell within a world like this. I just hope that neither of them become too clichéd, but I’ve liked what I’ve seen so far. The art is consistent throughout and Carnero does a good job with the action scenes and animating movement. Carnero really captured combat from the game in still form. However, I found the colors a bit muted, with only the reds popping out at any given time. The battle and night scenes were the typical dark and grey scheme. When the scene moved to the daytime, I didn’t really get the impression that parts of the story were taking place in a colorful, vibrant city. The color palettes were mostly muted and I expected a bit more. As for the character design, nothing really stood out. I couldn’t really see anything distinctive about the characters in both the way they dressed and their overall look. However, I see all of these as growing pains and feel that the art will improve as the series hits its stride. In conclusion, if you are a fan of Dragon Age, check Magekiller out! It will satisfy your Dragon Age itch and leave you wanting more. While the book is a great addition to Dragon Age lore, I do caution those who aren’t fans of the games before they read it. This comic assumes that you know what’s going on and jumps right into the story. While the book does try and give you a little overview in the beginning, it’s not nearly enough to understand what’s going on. So, check out the games before you read this, you won’t regret it! The first issue of Dragon Age: Magekiller will be in stores on December 16th! Ravi Persaud is a second year student at the Benjamin N. Cardozo School of Law and a staff editor of the Cardozo Arts and Entertainment Law Journal. He is a co-founder of the Motion Picture Club. (http://www.motionpictureclubs.com).